Age is not a disease. However, it does seem to come with some baggage. As our pets age, we may notice that some things are a bit more difficult than they use to be. For example, they may lose their balance trying to walk over a door threshold, or they might be slower to climb or descend the stairs. 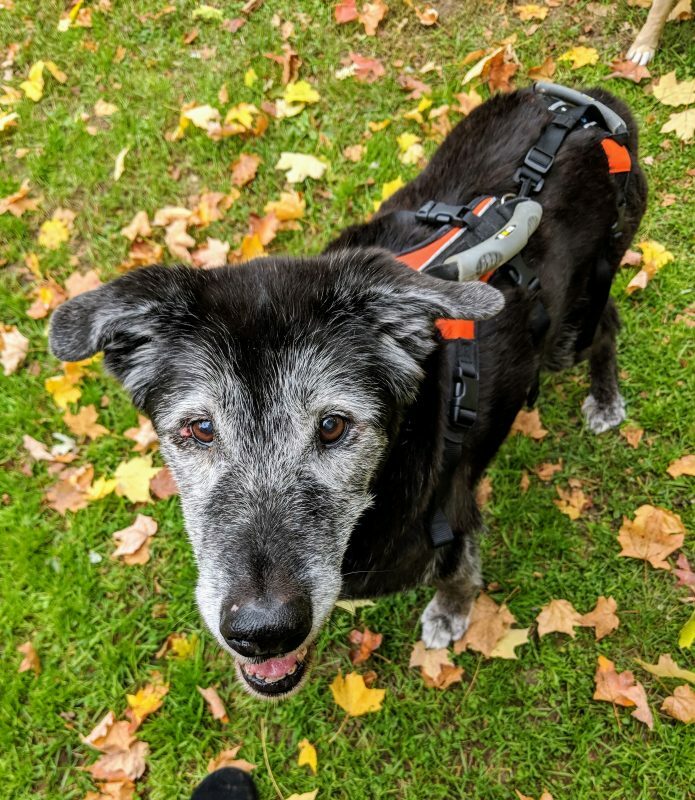 In this month’s blog, we will give you some tips and tricks to help make life a little easier and more enjoyable for your senior dog. Eyesight changes for most people as they age, typically for the worse. Our depth perception is not as sharp and we’re not able to focus as easily or at all. The same is true for our pets. While we cannot correct their vision, we can help them out by providing good lighting, particularly at night when going out for bathroom breaks and on any stairs (both inside and outside). Having good footing is very important for our senior pets. It helps to prevents slips, falls, and any resulting injuries. It also helps to give them a little more confidence in their mobility. Our favorite way to give better traction is to use yoga mats over slippery surfaces. Yoga mats are a little tacky on both sides to provide good traction and they tend not to slide around. Carpet runners are a good substitute if they have a rubber backing. Another way to improve your pets traction is to make sure their paw pads are clear of any fur (especially important for longer-haired breeds) and also to keep their nails trimmed as short as possible. Keeping the fur and nails trimmed allows the toe pads to contact the ground as much as possible. As people age, we go through a natural process called sarcopenia, which is loss of muscle tissue. Our canine companions also go through this process. The problem is that this muscle loss makes simple actions, such as walking or rising from a sit, a lot more difficult. Our pets compensate by avoiding certain things (ie: stairs) or change how they move altogether which may, in turn, cause further decrease in muscle mass. It is easy to see how this can be a vicious cycle. You can interrupt the cycle by working on structured exercises to target specific muscle groups. You should always work with a veterinarian certified in canine rehabilitation (such as Dr. Kern and Dr. Nelson at Pawsitive Steps!) 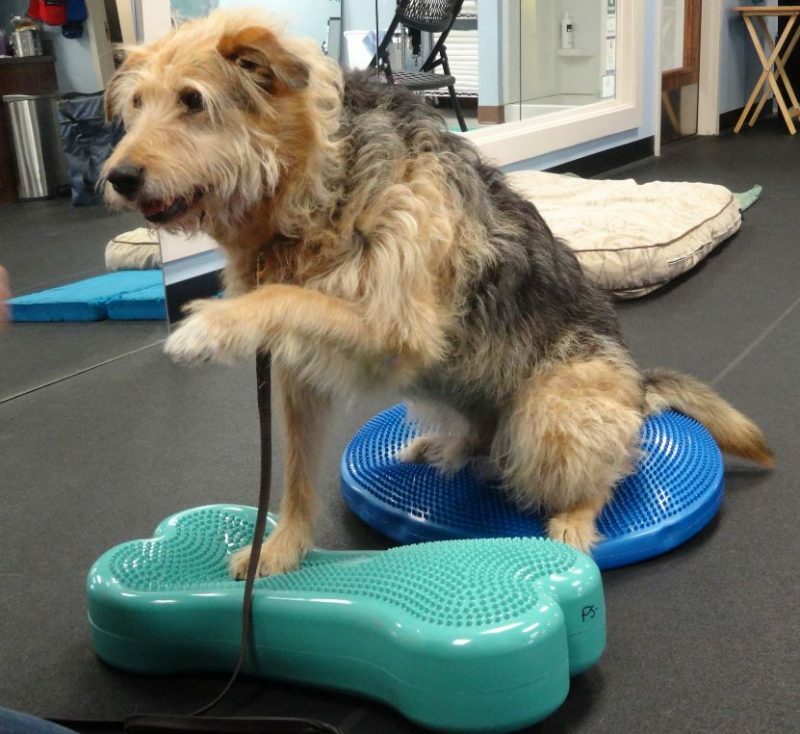 to determine which exercises would be appropriate for your pet. Many of our older pets suffer from arthritis, though there are any number of conditions that may cause pain. This can range anywhere from a mild nuisance to being very painful. Keeping you furry friend’s pain controlled is extremely important for their quality of life. Dogs who are stiff and/or sore tend to minimize or avoid movement. When they are less active, they tend to get more stiff/sore, causing them to want to move even less. Most people assume that pain medications are the only way to help control pain. However, this is not the case. We may use pain medications in conjunction with other modalities, such as massage, laser therapy, therapeutic ultrasound, even structured exercises. Sometimes our senior animals get into a routine, and there isn’t really any variation from it. Some pets get bored and may even seem depressed to their owners. Changing things up every once in a while can really boost their morale and stimulate their brains. It is important to note that not every routine variation is going to work for every dog. You know your own dog better than anyone, so use your judgement to determine which switch-ups your dog might like. If you want to try something new but have some concerns, talk with your veterinary team about your plans. They may have some suggestions to help make the experience a good one for everyone. Supplements can be really helpful in improving your animal’s quality of life. There are supplements that help support their joints, some that support their immune system, and others that help boost their GI health. There are some supplements that can even help with pain management. Always consult with your veterinarian before starting any supplements, as some may not be an appropriate option for your pet depending on health concerns or other medications that your pet is currently taking. Getting into the car or climbing the stairs can be very difficult tasks. As our furry friends get older, they sometimes need a little boost. There are harness systems that are designed to make giving that boost a bit easier for us. Our preferred harness is called the Help ‘Em Up Harness. Or maybe your companion is not able to take those long walks anymore. In this case, a canine wheelchair might be something to consider. Our preferred wheelchair company is Eddie’s Wheels. Wheelchairs are a wonderful option that can give our dogs a good deal of their mobility back. These are just a few examples of assistive devices that are available. Devices such as these can help give back some mobility to our senior pets and will often times help us to help them. Sometimes things can get a little challenging for our senior pets. But with these helpful tips, we can make their golden years a little easier and let them enjoy the best days of their life! Next: What’s In A Pant?